You are at higher risk for developing type 2 diabetes if you are overweight, don’t exercise, are over 45, or have close relatives with diabetes, especially type 2 diabetes. Higher-risk ethnic groups include African American, Latino/Hispanic, Native American, Alaska Native, Asians and Pacific Islanders. Native Americans and Alaska Natives are at more than twice the risk of Caucasians for developing type 2 diabetes. Much of the food we eat is broken down by digestive juices into a simple sugar calledglucose, which is the body’s main source of energy. Glucose passes into the bloodstream and, from there, into cells, which use it for energy. However, most cells require the hormone insulin to “unlock” them so glucose can enter. 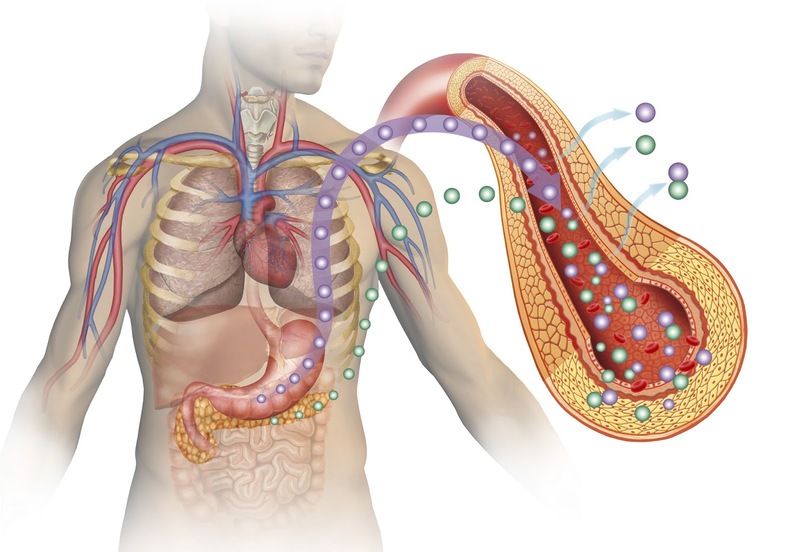 Insulin is normally produced by beta cells in the pancreas (a large gland behind the stomach). In healthy people, the process of eating signals the pancreas to produce the right amount of insulin to enable the glucose from the food to get into cells. If this process fails or doesn’t work properly, diabetes develops. In people with diabetes, the pancreas produces little or no insulin, or the body’s cells do not respond to the insulin that is produced. As a result, glucose builds up in the blood, overflows into the urine and passes out of the body. Thus, the body loses its main source of fuel even though the blood contains large amounts of glucose. the pancreas makes little or no insulin because the insulin-producing beta cells have been destroyed. Type 1 diabetes is less common than type 2 diabetes, accounting for about 5 to 10 percent of diabetes cases. Formerly known as “juvenile diabetes,” type 1 typically develops during childhood or young adulthood but can appear at any age.Type 1 diabetes is classified as an autoimmune disease—a condition that results when the immune system turns against a specific part or system of the body. In diabetes, the immune system attacks and destroys the insulin-producing beta cells in the pancreas. Scientists do not know exactly what causes the body’s immune system to attack the beta cells, but they believe that both genetic and environmental factors are involved. A third type of diabetes, gestational diabetes, is one of the most common problems of pregnancy. Left uncontrolled, it can be dangerous for both baby and mother.During normal pregnancy, hormones produced by the placenta increase the mother’s resistance to insulin. Gestational diabetes results when the insulin resistance exceeds the body’s capacity to make additional insulin to overcome it. This resistance usually disappears when the pregnancy ends, but women who have had gestational diabetes have a 35 to 60 percent chance of developing diabetes during the 10 to 20 years after their pregnancy, according to the CDC. All pregnant women are routinely screened for gestational diabetes between their 24th and 28th weeks. A new term, “pre-diabetes,” describes an increasingly common condition in which blood glucose levels are higher than normal, but not high enough for a diagnosis of diabetes. About 57 million people in the United States have prediabetes.Those with prediabetes have impaired fasting glucose (between 100 and 126 mg/dL after an overnight fast), or they have impaired glucose tolerance as indicated by one or more simple tests used to measure glucose levels. The ADA reports that in one study, about 11 percent of people with prediabetes developed type 2 diabetes each year during the average three years of follow-up. Other research shows that most people with this condition go on to develop type 2 diabetes within 10 years unless they make modest changes in their diet and level of physical activity.Some long-term damaging effects to the body, particularly the heart and circulatory system, may start during the prediabetes phase of the disease. In the United States, 11.5 million women age 20 and older (10.2 percent) have diabetes. Women with diabetes develop heart disease more often than other women, and their heart disease is more severe. In fact, approximately two-thirds of women with diabetes die from cardiovascular disease, and they die younger than women without diabetes. Women under age 50 with diabetes are more vulnerable to heart attacks and strokes than those without diabetes because the disease seems to cancel the protective effects of estrogen on a woman’s heart before menopause. Women with diabetes are also at even greater risk for developing heart disease after menopause. Women with diabetes have lower levels of high-density lipoproteins (HDL) cholesterol(the good cholesterol) and higher levels of triglycerides, or fats, in the blood. Elevated low-density lipoproteins (LDL) cholesterol is a major cause of coronary heart diseaseand should be treated aggressively. Although LDL cholesterol (the type of cholesterol that contributes to plaque buildup in your arteries) levels are not higher in women with diabetes, studies find that reducing LDL levels to less than 100 mg/dL can help prevent heart attacks and strokes in women with diabetes. For more information on the link between diabetes and heart disease, check out the National Heart, Lung and Blood Institute’s web site at www.HealthInfi.com. Urinary tract and vaginal infections. Urinary tract infections and vaginal yeast infections are more common in women with diabetes. The fungi and bacteria that cause these infections thrive in a high-sugar environment, and the body’s immune system can’t fight them as effectively when blood glucose levels are too high. Menstrual problems. Irregular menstrual periods are common in women with diabetes, especially if their blood glucose isn’t well controlled. Blood glucose levels may rise, and insulin needs may increase before a woman’s period and fall once it begins. For women with type 1 diabetes, controlling blood glucose (blood sugar) levels may mean three to four (and sometimes more) shots of insulin a day, adjusting insulin doses to food and exercise, checking blood glucose up to eight times a day depending on their health care providers’ recommendations and adhering to a planned diet. For an accurate diagnosis, you should go to a health care professional’s office or medical lab to have a fasting blood glucose sample taken. While finger-stick screenings—the kind given at mobile health fairs—are more convenient and cheaper, they are less reliable and precise and must be confirmed by medical lab testing. A fasting finger-stick test result of 110 mg/dL or more should send you to a health care professional for further testing. If you’ve eaten shortly before the finger-stick test, see a health care professional if your reading is 140 mg/dL or higher. The easiest, most economical test for diabetes is one that measures fasting plasma glucose. This blood test is usually done in the morning, after an overnight fast, at a health care professional’s office or lab. The normal, nondiabetic range for blood glucose is from 70 to 99 mg/dL. A level over 126 mg/dL usually means diabetes (except for newborns and some pregnant women). A fasting blood glucose test of 100 mg/dL or greater, but less than 126 mg/dL, indicates impaired fasting glucose, now recognized as prediabetes. Another blood test, the so-called “casual” or random plasma glucose test, can be taken any time of day. Diabetes is indicated if your glucose level is greater than or equal to 200 mg/dL and you have symptoms such as increased thirst and urination, constant hunger, weight loss, blurred vision and extreme tiredness in the case of type 1 diabetes, and feeling tired or ill, frequent urination (especially at night), unusual thirst, weight loss, blurred vision, frequent infections and slow wound healing in the case of type 2. An oral glucose tolerance test (OGTT), which takes two to three hours and involves three to six blood samples, is also available; its value lies in measuring how glucose levels change in response to a high glucose load. Many people with diabetes don’t have access to the help they need to adequately manage their condition. In addition, learning diabetes management skills takes time. People with diabetes need to regularly review and revise their strategies for managing their disease, under the guidance of their health care professionals. Raw foods, for example, are digested more slowly than cooked foods. Foods that are broken down more slowly release glucose into the blood more slowly. Foods that contain fat also take longer to digest than foods without fat. That’s why an ice cream cone or a chocolate bar may not cause blood glucose levels to rise as quickly as you might expect. Checking your blood glucose two hours after eating carbohydrates is the best way to learn the effects of different foods. Choose lean meats such as cuts of beef and pork that end in “loin,” for example. pork loin and sirloin. Remove the skin from chicken and turkey. Drink water and calorie-free “diet” drinks instead of regular soda, fruit punch, sweet tea and other sugar-sweetened drinks. Cook with liquid oils instead of solid fats that can be high in saturated and trans fats. And if you’re trying to lose weight, watch your portion sizes of added fats. Although we still don’t know why, being overweight makes you less responsive to insulin, while losing weight has the opposite effect. You don’t have to lose a lot of weight to see an improvement. Even losing 7 to 10 percent of your body weight helps. The focus for women with diabetes, however, should be on improving blood glucose levels—not on the scale. Regular exercise is an essential part of managing type 1 diabetes, too, but management of blood glucose during exercise can be complicated. Those with type 1 diabetes have to adjust their food or insulin to keep their blood glucose from getting too high or too low. A vigorous workout, for example, can increase the amount of glucose the liver releases into the bloodstream, causing blood glucose levels to rise, especially right after exercising. Strenuous exercise can push high blood glucose levels even higher if there isn’t enough circulating insulin available, leading to a life-threatening condition called diabetic ketoacidosis. Or, if blood glucose levels are low when exercise starts or if exercise is prolonged, low blood glucose or hypoglycemia can result. Thus, it’s important to know and heed the signs of low blood glucose and be prepared to adjust meals or medication to keep glucose levels from plummeting. You need to check blood glucose levels before, during and after exercise to see what affect your workout has. No two people with diabetes will have the same response to exercise. To avoid injury, start slowly and don’t overdo the intensity. Be sure to include a warm-up and cool-down phase. And understand that the effect of exercise on insulin resistance is short-lived. You have to stay with it to see improvement. Exercise doesn’t have to be sports-oriented or vigorous, however. It can be recreational, such as gardening, hiking, swimming or dancing. Brisk walking is one of the best things to do. Aim for at least 30 minutes of exercise a day, most days of the week. If you’re trying to lose weight, you may need to exercise 60 to 90 minutes a day. Don’t exercise in extreme temperatures. Don’t exercise if you have untreated eye problems such as blurred vision. Most insulin is still primarily administered as an injection, using a small short needle. At this point, insulin can’t be delivered in a pill, because it is a protein; that means your body would break it down and digest it before it could get into your bloodstream. However, investigators are exploring ways of making insulin easier to take, including insulin pills with a special coating or altered structure to get it through the stomach (not much research has been done on insulin pills at this point, though), skin patches, insulin that is delivered as a spray into the back of the mouth and inhaler devices. Biguanides help your liver respond better to insulin, decreasing the amount of glucose it releases. Other beneficial effects include a reduction in plasma triglyceride levels and low-density lipoprotein (LDL) cholesterol levels. Metformin (Glucophage and Glucophage XR – extended-release) are currently the only agents in this class available in the United States. Thiazolidinediones are insulin sensitizers that work to overcome insulin resistance by making the body’s cells more sensitive to insulin. Pioglitazone (ACTOS) and rosiglitazone (Avandia) are examples of drugs in this class. Of course, taking certain glucose-lowering medication can push blood glucose too low (which is hypoglycemia), as can skipping a meal or eating too little, exercising more than usual or drinking alcohol. You will know your blood glucose is low (70 mg/dL or less) when you feel one or more of the following: dizzy or light-headedness, hungry, nervous and shaky, sleepy or confused or sweaty. Check your glucose to make sure it’s low, and if it is at or below 70 mg/dL, consume 15 grams of carbohydrate—for example, drinking a half cup of juice or three-fourths of a cup of regular (not diet!) soda or taking three to four glucose tabs. Recheck your blood glucose in 15 minutes. If it is not above 80mg/dL, repeat the treatment. The lower your blood glucose, the greater the amount of carbohydrate you will need to bring it up and the longer it may take to reach an acceptable level. Verify your monitor’s accuracy and your skill at using it by taking it with you to an appointment with a health care professional and running the test at the same time as a venous test. Your monitor’s number should come within 20 percent of the laboratory test. Menopausal hormone therapy. Menopausal hormone therapy may pose risks for women with diabetes in addition to the risks identified in 2002 by the Women’s Health Initiative (WHI). Specifically, the hormone therapy used in the study increased levels of triglycerides (a type of fat-like cholesterol found in the bloodstream), a red flag for women with diabetes, who may have higher triglyceride levels to begin with. If you’re overweight and age 45 or older, you should be screened for diabetes via regular office visits with your primary care physician using either the fasting blood glucose test, which identifies impaired fasting glucose, or the oral glucose tolerance test, which identifies impaired glucose tolerance. If these measures don’t work, you might have to take diabetes medication or insulin shots. While you may not be able to prevent diabetes, there are many steps you can take to delay or lessen the severity of possible diabetes-related complications. If you have diabetes, you should have your eyes examined for diabetic retinopathy at least once a year by an eye specialist, or ophthalmologist. Progressive damage to the eye’s retina caused by long-term uncontrolled diabetes can result in loss of vision. People with both type 1 and type 2 diabetes are at risk for developing diabetic retinopathy. If you are not able to take care of your own feet, ask your health care professional. The term “prediabetes” describes an increasingly common condition in which blood glucose levels are higher than normal but not yet diabetes. Most people with this condition go on to develop type 2 diabetes within 10 years unless they make modest changes in their diet and level of physical activity. Risk factors that you can’t control are age, family history of diabetes and ethnic heritage. African Americans, Latino/Hispanics, Native Americans, Alaska Natives, Pacific Islanders and Asians are all more likely to develop type 2 diabetes (although Northern Europeans are more likely to contract type 1). It’s important to control the “ABCs” of diabetes: A for the A1C test (hemoglobin A1C); B for blood pressure and C for cholesterol. The National Institutes of Health and the American Diabetes Association recommend the following target numbers: A1C: below 7 (an average blood glucose of 150); blood pressure below 130/80; and LDL cholesterol below 100 and HDL greater than 60 mg/dL. LDL less than 70 mg/dL is desirable for those with both diabetes and heart disease. Could I have diabetes and not know it?Yes! According to the American Diabetes Association, 5.7 million of the 23.6 million Americans with diabetes have not been diagnosed. The onset of type 2 diabetic symptoms is usually gradual. Those symptoms include feeling tired or ill, frequent urination (especially at night), unusual thirst, weight loss, blurred vision, frequent infections and slow healing of sores. If you have any of these symptoms, seek testing immediately. Since some people do not have any symptoms initially, you should also be tested if you have any of the major risk factors, which include obesity, lack of exercise, a close relative with diabetes, high blood pressure or cholesterol level and giving birth to a baby that weighs more than nine pounds. You are also at elevated risk if you are over 45 or are of African American, American Indian, Alaska Native, Asian and Pacific Islander American or Latino/Hispanic descent. Can I just take one of those finger-stick tests at the health fair?No! These tests measure glucose levels in the capillaries, whereas the more reliable tests for diagnosis tap into your veins to get a truer reading. If you do have the opportunity to have a finger-stick test, be sure to follow up with a glucose test recommended and administered by your health care professional. Finger-stick tests may be used as an initial diabetes screening tool and for glucose monitoring of those with confirmed diabetes. What is the best test for diabetes?For most people, a fasting plasma glucose test is optimal. This blood test is usually done at a health care professional’s office or in a lab in the morning after an overnight fast and before you’ve eaten. The normal, nondiabetic range for blood glucose is from 70 to 100 mg/dL. A level over 126 mg/dL usually means diabetes (except for newborns and some pregnant women). A fasting plasma glucose test of 100 mg/dL or greater, but less than 126 mg/dL, indicates impaired fasting glucose or prediabetes, a frequent precursor to diabetes. I’ve got diabetes. How do I prevent debilitating damage to my eyes, kidneys and feet?Keeping your blood glucose and blood pressure in good control are the best means to reduce the risk of complications. Aim for an A1C under 7 percent. How do I reduce my risk for heart disease and stroke, the biggest killers of people with diabetes?Women with diabetes who keep their blood glucose, blood pressure and cholesterol levels in the recommended range can lower their risk of cardiovascular disease. What is intensive glucose management?Intensive glucose management may be used for patients who take insulin, particularly those with type 1 diabetes. Plans are individually tailored and involve frequently checking blood glucose, administering insulin on the basis of food intake and exercise, following a diet and exercise plan and frequently consulting a health care team. It all boils down to keeping your glucose level in the normal range as much of the time as possible. Intensive management is not for everyone—risks should be discussed with your health care professional. Is injecting insulin painful?No, because the needles are very small. It is virtually painless. What medications are available to treat type 2 diabetes?For type 2 diabetes, as long as your body is making enough insulin, you won’t need insulin injections. Sometimes lifestyle modifications are sufficient to keep type 2 under control in the early years, but many types of medications can help those with type 2 diabetes lower their blood glucose by such means as stimulating insulin production, decreasing the amount of glucose made by the liver, slowing starch absorption and boosting insulin sensitivity. You and your health care professional can decide what is best for you. What causes hypoglycemia and hyperglycemia?Both hypoglycemia (low blood glucose) and hyperglycemia (high blood glucose) can occur when patients take some oral medications or insulin to treat diabetes. They can occur from taking too much or too little medication or from eating too much or too little food or from excessive exercise. Learning how to manage your diabetes properly is the key to avoiding hypoglycemia and hyperglycemia. Some people may have hypoglycemia without having diabetes, and in some cases it may be diagnosed as a possible precursor to diabetes. In all instances, it’s important to learn to manage your diet and exercise to help control blood glucose levels.